Buy a gift for someone special, with an unforgettable night out at the cinema. With a Woolton Picture House Gift Card you can choose exactly what you want to see, when you want to see it. Presented in a FREE LUXURY GIFT BOX a Woolton Picture House gift card could be just what you’re looking for... the perfect gift. 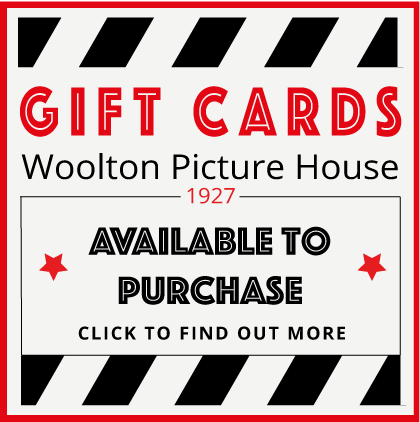 Visit Woolton Picture House and inform us that you would like to purchase a Gift Card "Hi, I would like to buy a Gift Card" - or something to that effect. While we are having a chat (if your not a fan of chatting, not to worry this is not a required step); You choose how much money you want to put on the Gift Card (minimum of £5.00). You pay for the amount that you are putting on the card via cash or credit/debit card. We will provide the rest as the Gift Card is presented in a FREE GIFT BOX ready to gift! You hand the Gift Box to your friend, partner, child, significant other, boss - wow, how good are you. Pat yourself on the back...for a Job Well Done! Say a big Thank you to the lovely person who has bought you a great gift! You check out the latest movies that we are screening at the Woolton Picture House...If you fancy seeing any of the movies out that month come visit us. You can use your Gift Card to purchase movie tickets, drinks, snacks (yes, that lovely person has bought you alcohol & popcorn). You present your Gift Card and pay for your selected items with that. Sit back...Relax and Enjoy the Movie!